Some context for this review: I’m a huge Brandon Sanderson fan, and I thought The Way of Kings was his best book, so I was really sure I would love this book. I re-read the first book in anticipation, and I couldn’t stop thinking about what would happen next. I’m glad (but not surprised) to say that I wasn’t disappointed at all. Spoilers for The Way of Kings follow. Words of Radiance picks up right where the previous book left off, with Jasnah and Shallan on their way to the Shattered Plains and a newly confident Dalinar Kholin plotting with Elhokar on how to unite the highprinces. As expected, both efforts run into some difficulty. I’m not going to say any more about the plot because I don’t want to give anything away. I’ll just say that events take some pretty shocking turns, and also some wonderful ones. This was advertised as “the Shallan book”, and we certainly learn a lot more about her in it. It is spread out over several flashbacks, and we don’t get all of it until the end (which drove me crazy, because I had to constantly keep myself from skipping ahead to the next flashback). Her story was not what I expected, and I ended up liking her even more because of it – she’s been through a lot and turned out fairly well. Her powers are tied perfectly to her story, and I can’t wait to see what she does with them next.We also learn a lot more about the world of Roshar and the wider events going on in this book (often through the perspective of a one-time narrator). It was especially nice to get a Parshendi viewpoint, and see their side of things first-hand. A lot more also happens that I thought Sanderson would wait a few more books to reveal, which is pretty exciting. The world is changing quickly. We get a lot more Adolin in this book, which I thoroughly enjoyed. There is romance in this book, and it was fun. I’m just hoping it doesn’t turn into a love triangle, because that would be frustrating. Roshar is a pretty small place, because characters I never thought I’d see again return, and are given good character development. Some characters that I thought would be pretty significant given the way the last book ended didn’t end up getting much screen (page?) time. 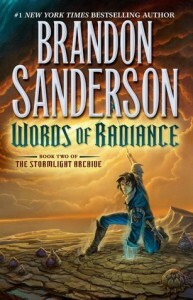 I love that each of the Stormlight Archive books is named after a fictional book – I hope that trend continues. I’m not saying this was a perfect book, though – I had some issues. Many of the characters suffer a big shock in the book, and I felt like they took in stride too easily. Except one person, no one seemed to think about or talk about it. I was also annoyed that some plot developments happened off-screen, but I guess a lot of ground was covered in this book that wouldn’t have been able to be covered if we’d spent time with that character. However, my only major complaint is that I have to wait a year or more for the next book.